Create a location-based mobile app with Matchmore. Second and last part. 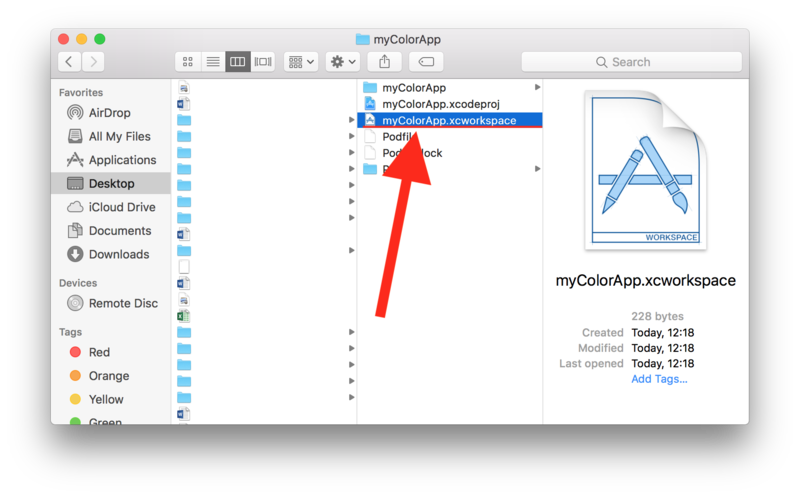 This tutorial will show you how to create an iOS app that changes the color of surrounding devices' screens to match the most recent published value. We'll be working with Matchmore iOS SDK which encapsulates well known CoreLocation framework. The code will be written in Swift 4 for iOS9 and Xcode 9.2. This tutorial is to show you how quick and easy it is to get a proof-of-concept proximity detection based location app. Integrate Matchmore to make geomatching and color surroundings devices screen (this post). We are back for the part two of this tutorial. You are going to integrate Matchmore to your ready UI project built in part one. If you are joining us now, please have a look at the previous blog post to catch up, or you can download it myColorApp part one. 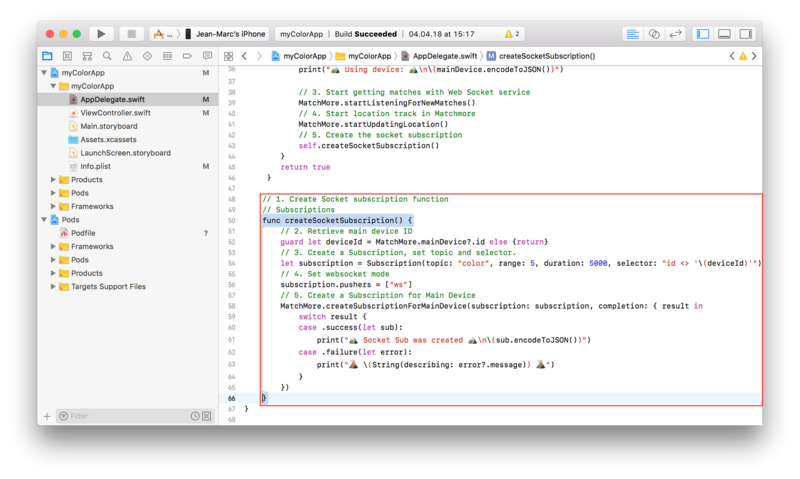 First, you need to inject Matchmore in your Xcode project. You'll need CocoaPods. 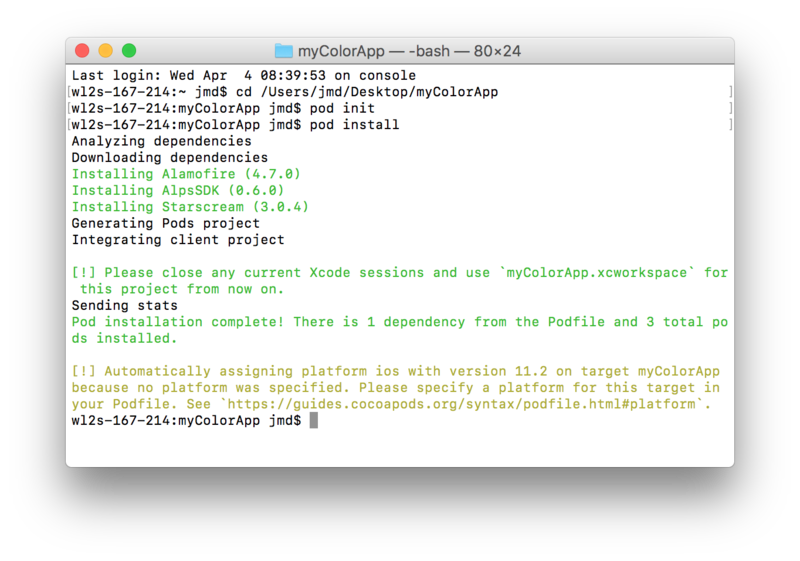 If you don’t have CocoaPods installed on your machine, check out Adam's blog post for a quick explanation. 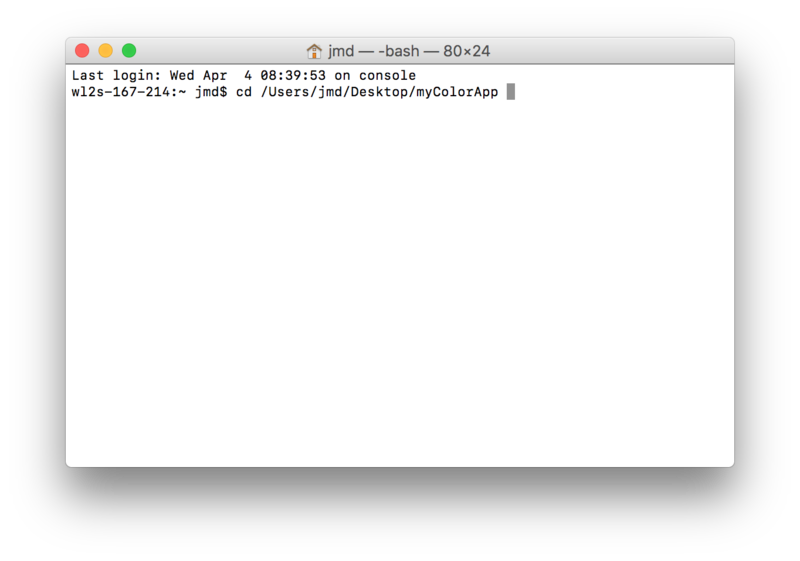 Open Terminal, locate to your project folder, like image below. It will create a file named Podfile in the main directory of the project. 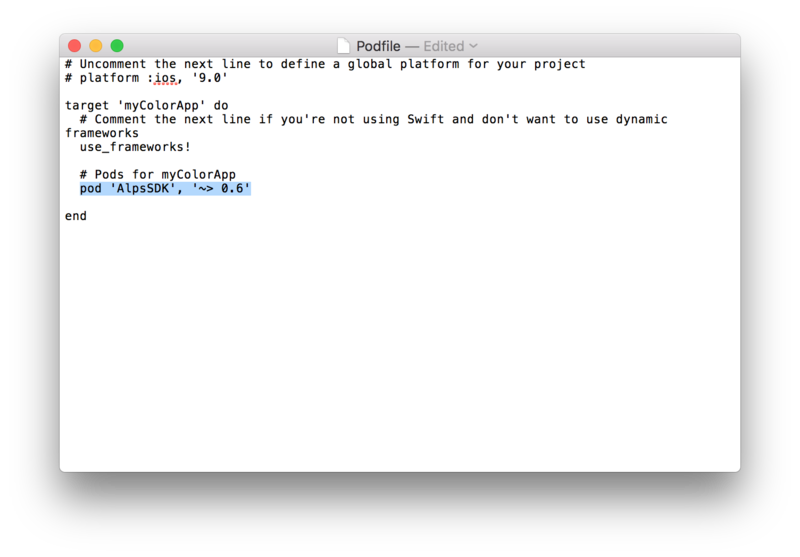 Open the Podfile and add the following line under use_frameworks. pod install, press Enter. See result below. Open the newly created myColorApp.xcworkspace. See image below. Matchmore SDK is implemented as a wrapper, so whenever we need to use Matchmore's features we need to add the import right at the top of the class. Matchmore is a very malleable SDK. It is configured by default to work for general cases. But it is possible to configure it according to our needs. For our colors app, we will initiate Matchmore with particular configurations, because our app does not need to update locations in the background. Inside of func didFinishLaunchingWithOptions() in your AppDelegate. We configure LocationManager to pause automatically to save battery and location tracking for best accuracy. Also, we request permission for only when-in-use location tracking, because our app does not need to track location in background mode. N.B. : For every app that needs to track location, it is required to have correct access rights. Usually, you need to add some lines of code but our SDK already does it for you. To configure Matchmore SDK, you need to create an instance of MatchMoreConfig with the required parameters; the API-key and the customized LocationManager. You can generate an API-key in your app dashboard. Set Matchmore SDK with the configuration we have predetermined in the MatchMoreConfig object. Now you can run the app. But your app won't prompt location authorization alert, because you should go to Info.plist file and add the permission request. Add a new row and find Privacy - Location When In Use Usage Description. Add value for this key, e.g. 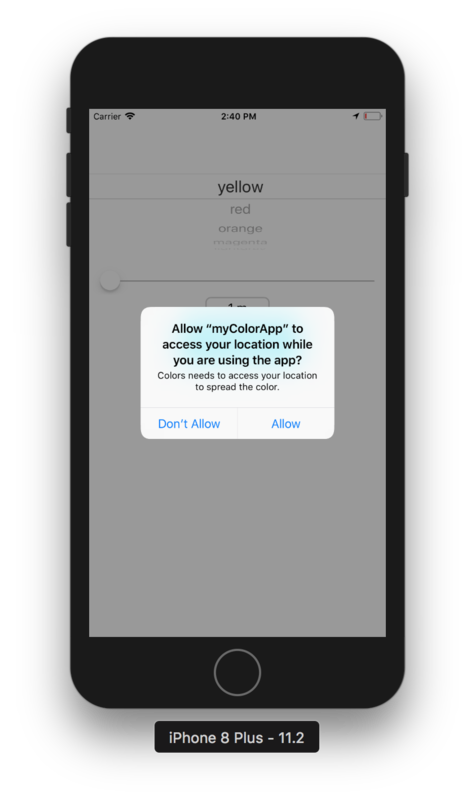 “Colors needs to access your location to spread the color.”. This key is required when we use requestWhenInUseAuthorization() method. Otherwise, the system will ignore location request. This key describes why your system wants to use user’s location. After adding this key you can run the app once again. Now the system will prompt authorization alert with our description. Matchmore SDK can be used in different ways, but the most common way is to have a main device. Usually, this main device is the device on which the app is running. Use the wrapper MatchMore and call the method startUsingMainDevice() to start the registration app running device in Matchmore service. MatchMore SDK's methods are generally having an asynchronous callback. To handle it, you need to declare closure.result is an enum, you need to unwrap it. When it is a success the callback returns the object created in Matchmore backend service, else when it is a failure, the callback is an error containing a message that describes what happened. Start the web socket service to get matches. Start informing Matchmore service that your app is moving. Add this line, you'll create a function called createSocketSubscription, explanation further. Now, you will create a subscription to the main device. Subscribers are the ones that are notified when matches occur. In our case, when matches occur our background should change according to the color chosen by the publishers. // 3. Create a Subscription, set topic and selector. 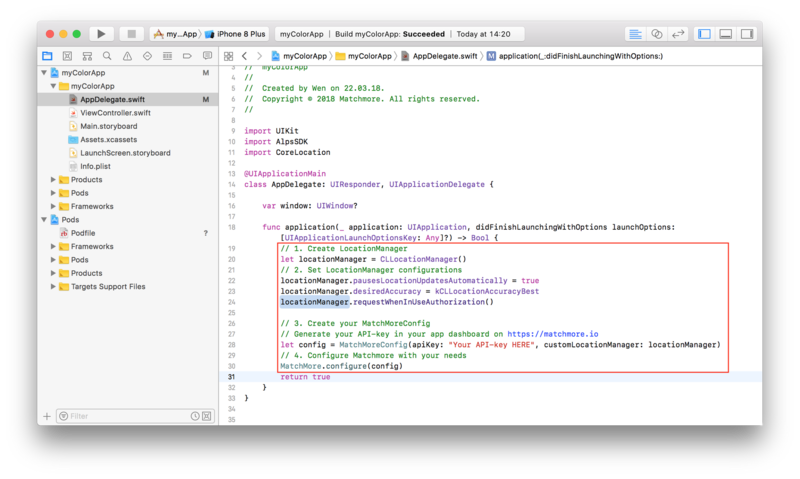 In AppDelegate.swift, just above the last curly brace ( } ). Create a function named createSocketSubscription() taking no parameter and returning nothing. Retrieve main device ID, you'll need it in order to not change the color of your own screen (We don't want to match our own main device's publications). Create a subscription to listen for the color changes sent by other devices. The topic is our first filter, we set color. Every publication that is set on topic color will concern the color features. Put range equals to 5 (meters), duration equals to 5000 (seconds). Next, set the selector equals to id <> '\(deviceId)'. We are setting a property filter to match only with publications for which the id are not equal to ours. N.B. : <> is not equal. Since we will use web socket to get matches notification, we need to configure the pusher equals to ws. Last but not least, use the wrapper MatchMore and call the method createSubscriptionForMainDevice() to send the creation request to Matchmore service. N.B. : Don't forget we need to handle two cases, in case of success we retrieve the created object, and in case of failure, we retrieve an error. To distribute the selected color on the screen of the surrounding devices, you must use publications. When a device is a publisher, it is as if it broadcast its presence. The publications can contain a lot of information, all this information is grouped in the property value. N.B . : A device can be both publisher and subscriber at the same time. In ViewController.swift, just above the last curly brace ( } ). Create a function named createPublication() taking no parameter and returning nothing. Retrieve selected picker row, selected range, and main device ID. You'll need it in order to not change the color of your own screen (We don't want to match our own main device's publications). Create a publication to spread the chosen color. Remember the topic is our first filter, to have matches both publications and subscriptions need to be created on the same unique topic. The topic is color. Then, the range is filled with the selected range by the user. Set duration to 100 (seconds). Now, you can set properties to transmit either some supplement information or to allow finer filtering for the subscribers of topic color. Obviously, a property key is named color and contains the value of selected color the user wants to spread. And one more property key is id, to allow finer filtering to not match our own publications. Finally, use the wrapper MatchMore and call the method createPublicationForMainDevice() to send the creation request to Matchmore service. N.B. : Don't forget we need to handle two cases, in case of success we retrieve the created object, and in case of failure, we retrieve an error. 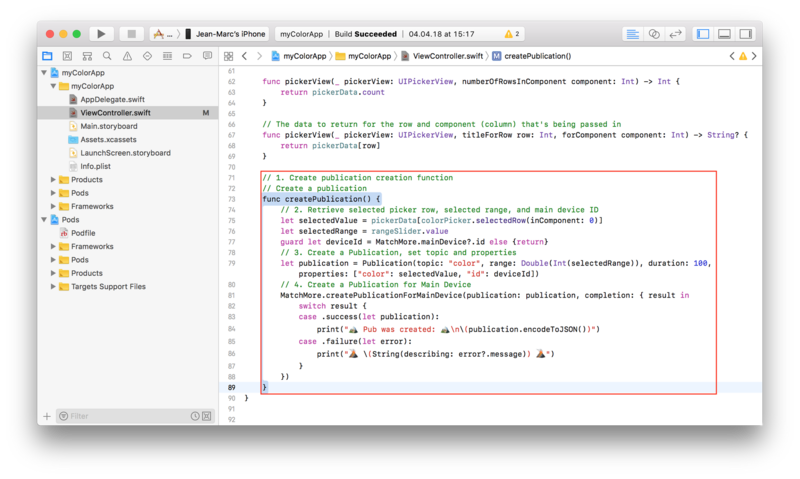 With createPublication() function ready, we can set the actions for our UIActions objects. Find func changeColor(_ sender: Any). Add the following line: self.rangeLabel.text = "\(Int(rangeSlider.value)) m"
All that is left is to handle matches. When matches occur, you'll need to find the publication in it and get the color which your screen should adopt. Let's handle matches. Make your class ViewController conform to the MatchDelegate protocol. 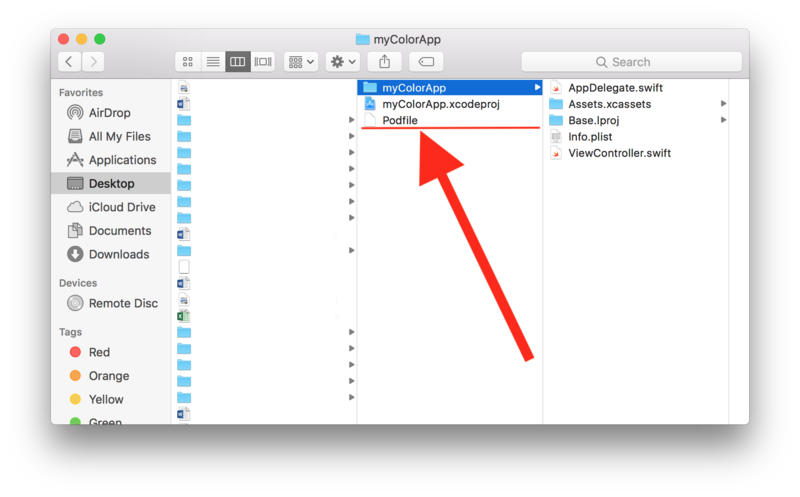 Also, add var onMatch which is a closure and the array colors which contains the UIColor object. 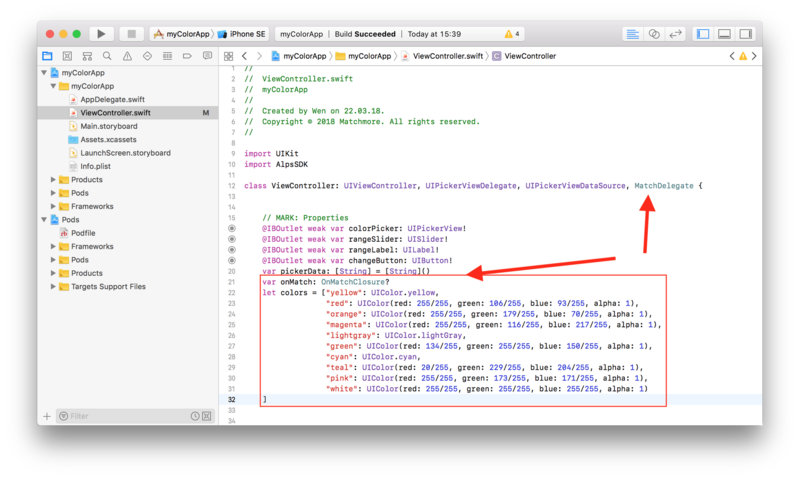 Inside of func viewDidLoad() in your ViewController.swift file. You'll create the delegate function for onMatch listener. onMatchClosure are triggered every time you get a new match. The callback is composed of an array of hundred last matches, plus the concerned device. Filter the matches based on their createdAt timestamp to retrieve the most recent match. Safely unwrap the value you'll use. Call self.view and color the background with the spread color. Earlier, we have made ViewController conform to MatchDelegate protocol. In order to be informed of every match, you'll need to add ViewController to Matchmore wrapper match delegates list. 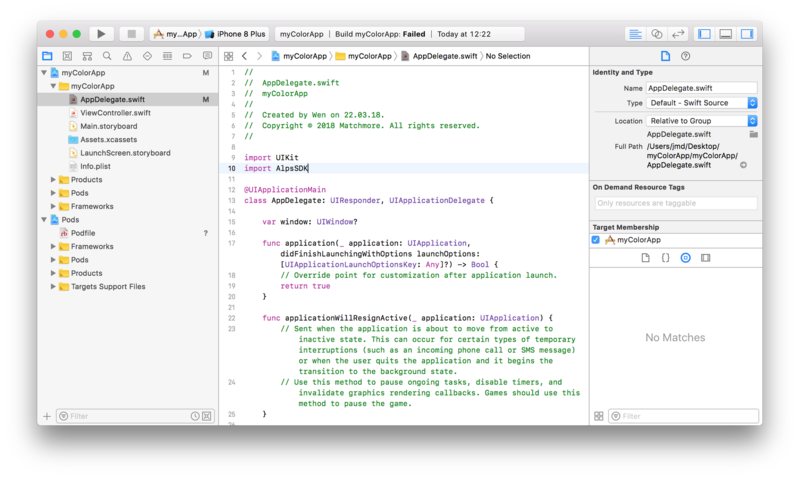 Before trying the app in the simulator, don't forget to provide a valid API-key to MatchmoreConfig object in the AppDelegate.swift. In this tutorial, you learned how to use Matchmore and get a quick working proof-of-concept proximity detection app. I hope you enjoyed it as much as I did, and that you will be able to use Matchmore in many others of your projects! Remember to check out the first blog post in this series. And of you liked this tutorial, check out the rest of our tutorials here. Have you been thinking about creating a location-based mobile app, but not sure if it's worth it due to the massive battery consumption? This blog post gives you several proposals on how you can be smart regarding the battery when creating a location-based iOS app. Enjoy! Curious about Matchmore and geomatching? Learn how to create a proximity detection based location app by following this easy tutorial. This is the first part (of two) in this guide. Get started today!